This, our 28th neighborhood letter, is full of news and happenings for the holiday season, plus a rambling about our fun design process and some new or improved amenities. As always, we are honored that you choose to be our guests at our restaurants and/or hotels and that you choose to receive these letters. If you don’t want to continue to get them, please just email us at qwrhinfo@qwrh.com. Conversely, if you wish to receive more frequent news and ramblings electronically, please sign up here or our visit out Facebook pages at Lucky 32 Southern Kitchen, Green Valley Grill, Print Works Bistro, O.Henry Hotel and Proximity Hotel. more effort and money than others on improvements. We are always considering how we can make our places more inviting and comfortable for our guests and colleagues. It is really the way that family-owned hotels and restaurants have done it for eons, but not for most corporate-owned places. of how this works: I lead the design team, and Bradshaw is the lead designer. Beyond his competence, he is charming and fun! • Depending on the project, we add people to this group. Leah Thompson collaborates with us, and she has the tough job of reminding us of our priorities (otherwise Bradshaw and I would be off laughing about something). Leah wears many hats around here, including leading the People Department (what most call Human Resources) and our Sustainable Practices Initiative. Anna Will, a star graduate student at UNCG, helps Leah and the team on resources and implementation. • Chip Holton, QW’s Artist-in-Residence, is often a collaborator, as are many other artists and craftspeople. For instance, Jeff Hurr, an amazing metal sculptor and all-around good guy, not only helps us figure things out, but also builds all kinds of things like the wine racks at Print Works and the armillary light fixtures in the eighth-floor guest rooms at the Proximity… just to name a couple. Plus, we call on my wonderful wife and partner, Nancy King Quaintance, when need be. And we always get Will Stevens, President of QW Management and Development, involved when it comes time to apply the “practical” filter. • Second, we are fiercely loyal to the idea that “process is more important than outcome.” Easy to say. Hard to do. This doesn’t come naturally to me (I don’t think it comes naturally to most). But I’ve come to trust it. We find that we get better outcomes staying focused on process, so we continue to employ this model even though it is more work. I got onto this idea when Chip Holton gave me a copy of Bruce Mau’s Incomplete Manifesto for Growthabout 14 years ago. One of its planks says, “Process is more important than outcome.” Mau puts it this way: “When the outcome drives the process, we will only ever go to where we’ve already been. If process drives outcome, we may not know where we’re going, but we will know we want to be there.” (Consider reading his book Massive Change. It is provocative.) Describing the various methods we use to stay process orientedwould take too many words. But the key ingredients are open-mindedness, being sincere about it and being willing to go deeper. four magnificent Magi Suites and the six Porter Suites have wonderful new furniture that any of us would be pleased to have in our homes. Each of these suites also now has several original pieces of art: watercolor and acrylic paintings. • We’ve completed a long list of design projects at our restaurants (the veggie cart at both Lucky’s is one of my favorite examples), and we are working on many more, including reupholstering the Green Valley Grill furniture with leather. As usual, we are using local craftspeople. 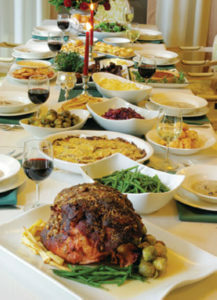 Christmas Dinner-to-Go:Give yourself the gift of a hassle-free celebration at home! Let Chef Leigh Hesling, Chef de Cuisine Carrie Longnecker and their amazing team prepare your “Christmas-to-Go.” Place your order by 10 PM on Saturday, December 22, and stop by on Christmas Eve or Christmas Day to pick up your holiday feast. You’ll be impressed by the offerings. To learn more or to place your order, call 336-379-0699 or visit printworksbistro.com. Holiday Dining: On both Thanksgiving and Christmas Day, Print Works Bistro serves several holiday specials in addition to our full dinner menu from 12 noon until 8 PM. The bar is open until 10 PM. Plus, we offer breakfast from 7:30 until 11 AM both days. For reservations, call 336-379-0699 or visit printworksbistro.com. Breakfast: We are thrilled with the evolution of the breakfast menu at Print Works Bistro. Take a culinary tour of Europe with quiche Lorraine, eggs Norwegian or crepes. And don’t forget those crème-filled warm beignets! It starts at 6:30 AM on Monday-Friday and 7:30 AM on weekends. Mussels-Wine-Music: We dared not dream that our Wednesday night special would be such an important tradition for our community. Thank you! We’ll keep on having Chef Leigh Hesling’s Mussels (more for less, with our house-cut fries) for $15, five wines from $10 to $15 a bottle and live acoustic music from 7 until 10 PM by AM rOdeO, featuring the extraordinary talents of Evan Olson and Jessica Mashburn. Talk about great flavors and a wonderful vibe! Reservations recommended. New Year’s Celebration at Print Works Bistro: On New Year’s Eve, we serve our full dinner menu plus a prix fixe menu. From 10 PM to 1 AM, enjoy the musical delights of DJ and singer Jessica Mashburn of AM rOdeO with no cover charge. On New Year’s Day, we open at 7:30 AM for breakfast, lunch at 11:15 AM and dinner at 4 PM. Turkey-to-Go: This has become a tradition for many, including us! Enjoy Chef Leigh Hesling’s amazing rotisserie turkey at home. Place your order by 10 PM on Monday, November 19, and then stop by on Thanksgiving Day (10 AM–3 PM) to pick up your juicy, wood-fired, rotisserie-roasted turkey with all the trimmings, including sides, salads, bread and dessert. To learn more or place your order, call 336-854-2015 or visit greenvalleygrill.com. four Sundays: December 2, 9, 16 or 23 at 2 PM. Treats inspired by dreams of dancing sugar plum fairies, toy soldiers and waltzing flowers will accompany your choice of seasonal tea, warm apple cider or hot chocolate. Talented actors in character mingle with guests as each child decorates an ornament. Plus, you’ll help our chefs make gingerbread houses. Afterwards, join Clara by the tree as she reads The Nutcracker. Bring your camera! $40 per person for adults and children, plus 20% service charge. Call 336-854-2015 for reservations. 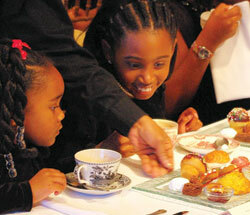 Also, join us any day of the week for afternoon tea in the lobby. Chef Leigh Hesling’s Cooking Classes: Here’s a great gift idea! Chef Leigh Hesling presents six cooking classes in 2013: three at Print Works Bistro(February 16, July 13 and October 12) and three at Green Valley Grill(January 19, June 15 and September 14). 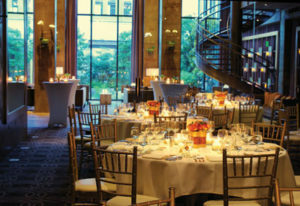 Tickets are $75 per guest, or mix and match a three-class package for $200. Enjoy a seasonal beverage during a cooking demonstration, then savor the food during a three-course meal with wine. Leigh is amazing. I promise that you’ll have fun, and you might even learn something! For tickets and reservations, contact Lee Healy at 336-478-9126 or lhealy@qwrh.com. New Event Spaces: Our new White Oak Room is amazing! Together with our 22-foot-high lobby, it can accommodate up to 250 people, which is more than we’ve ever been able to handle for our extraordinary bespoke events! Nearby is the new Latham Room event space. Read more about these in my rambling insert. 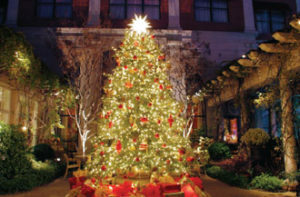 Sustainable Cheer: Stay on a Friday or Saturday night from November 23 through December 8, or any night from December 14 until January 12, 2013 (except New Year’s Eve), and receive a $30 amenity voucher for Print Works Bistro or other amenities. 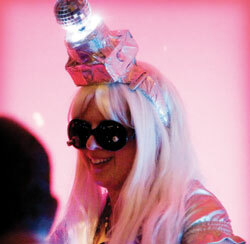 Proximity to Midnight: Start the celebration with a bottle of sparkling wine in your Loft King Room, continue the night with priority dinner reservations at Print Works Bistro, then say cheers to 2013 with their New Year’s Eve party. The next morning, relax with a late check-out of 2 PM. $239 plus taxes – stay a second night for $100 more. The Avett Brothers Concert: The indie folk-pop darlings perform at the Greensboro Coliseum on New Year’s Eve! The package includes overnight accommodations in a Loft King Room and two show tickets. Sleep late the following morning with a 2 PM check-out. Accolades: We are tickled pink with the recent national awards that Proximity has received: Travel+Leisure’s 2012 World’s Best Award for Top 50 Hotels in the USA (wow… that is a big deal! ), Entrepreneur Magazine named Greensboro (with Proximity) for “Best Small City for Business Travel,” we were awarded “Best of Weddings” by The Knot magazine, and received the AAA Four Diamond Award for the fourth year. Skillet-Fried Chicken: From 4 PM ‘til we run out on Wednesdays in Caryand on Tuesdays in Greensboro (except New Year’s Day), indulge yourself with Chef Jay Pierce’s wonderful, cooked-to-order skillet-fried chicken. We also have some beers and wines at special prices and, as usual, we serve our regular menu. Tuesday’s Live Music in Greensboro’s Bar: The fantastic chicken is topped with amazing live music by the very talented Laurelyn Dossett or some of her friends (or both! ), from 7–10 PM with no cover charge. November: 6th Molly McGinn, 13th Martha Bassett and Friends, 20th Laurelyn Dossett and Scott Manring, 27th Martha Bassett and Friends. December: 4th Laurelyn Dossett and Scott Manring, 11th Molly McGinn, 18th Holiday Extravaganza. 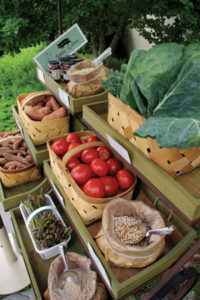 Veggie Cart: For years, we’ve been buying great food from local farms. Now, we set some of this good stuff out on an honor system cart. The carts are usually out front at both Lucky’s. When it’s raining or too cold, we move them inside. Farm-to-Fork Blog: We’ve had a blast this year following Chef Jay Pierce’s new blog, especially his series “Locavore’s Delight,” which explores farm finds through his eyes and palate. He also shares recipes and cooking tips. I think you’ll be glad if you check out the many past features, and “follow” the blog at lucky32southernkitchen.com to receive email alerts about new posts. Cooking Classes & Beer Dinners:Chef Jay Pierce’s cooking classes in Cary have become legendary. Turn off Food TV and tune in to Jay in person! He’s planning more classes in 2013, as well as several beer-themed dinners in both Greensboro and Cary. His Farmers’ Appreciation Dinner is November 11 in Greensboro. They fill up fast, so sign up for our email updates be the first in the know. Thanksgiving: Lucky 32 Southern Kitchen in Cary will serve Thanksgiving dinner 11:30 AM–7:30 PM. Lucky 32 in Greensboro will be closed on Thanksgiving. Both will close at 6 PM on Christmas Eve and will be closed on Christmas Day. Get Lucky & PARTY: If you are invited to one of those shindigs where they ask you to bring a covered dish, we’ve got you covered! You call, we cook, and we bring your order right to your car. Pick up half-pint and pint options of collards, soup, beans and greens, whipped sweet potatoes, creamy grits, pimento cheese, and artichoke dip, and don’t forget the black bean cakes! For complete Get Lucky & Go or our Holiday Sides & More Menus visit lucky32.com. New Year’s Day Menus: Get our full wonderful menu plus some “good luck” food like collard greens, country ham with red-eye gravy, grilled pork loin chops and hoppin’ John. If you are entertaining friends and family at home, take advantage of our “New Year’s Day-to-Go” with family-style portions of traditional side dishes to bring and pass off as your own! 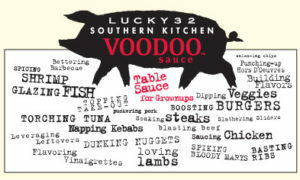 Voodoo Sauce: If you haven’t noticed, you can now get jars of our Voodoo Sauce to add to your recipes at home! We call it “table sauce for grownups” because most of us have a place for it next to salt and pepper. This really is good stuff. In addition to buying it at both Lucky’s, you can now find it in all Fresh Markets and at lucky32.com. It makes a great holiday gift. Find plenty of serving ideas and recipes at lucky32.com. We hope you’ll enjoy some sweet spice in your life! Take your picture by the O.Henry tree. Special Packages:There’s so much to do in Greensboro during the holiday season, including musical performances, art shows, theatre and shopping. Consider tying in those sorts of activities with a pampering package like the ones listed below (there are more at ohenryhotel.com). To reserve a package, please call our reservations team at 336-854-2000. Gift of the Magi: Check in early at 2 PM to a graciously appointed guestroom and use your $30 amenity voucher for Green Valley Grill, afternoon tea, in-room movies and more. The next morning, enjoy a full Southern-style breakfast buffet and relax with a late check-out of 2 PM. Available Friday and Saturday nights, November 23–December 8, or any night from December 14–January 12 (excluding New Year’s Eve). Triad Stage: Go to “one of the Best Regional Theatres in America” for a fabulous performance of A Christmas Carol or Santaland Diaries. Package includes one night’s gracious accommodations, two tickets to Triad Stage, transportation to and from the theatre, $30 credit toward dinner, wine and truffles in your room, Southern-style breakfast buffet and late check-out. Greensboro Symphony New Year’s: Stay at the O.Henry on New Year’s Eve, and prepare to be wowed, captivated and mesmerized as POPS sensation Steve Lippia treats you to an evening of greats in “Simply Swingin,” featuring hits by Nat King Cole, Bobby Darin, Tony Bennett, Frank Sinatra and Vic Damone! The package includes an overnight stay, a $30 credit towards dinner, two tickets and transportation to and from the performance. Ring in the New Year: Start your evening with a bottle of “J” Jordan sparkling wine in your luxurious guestroom. Then take advantage of priority dinner reservations at Green Valley Grill. Watch the arrival of 2013 in your room, snuggled with your honey. Or have a midnight toast in the lively Green Valley Grill bar (open until 1 AM). The next morning, enjoy breakfast in bed and a late check-out of 2 PM. $249 plus taxes – stay an extra night on that Sunday or Tuesday for only $100 more. Accolades: We are honored that TripAdvisor consistently rates O.Henry the top Greensboro hotel! Plus, AAA awarded us the Four Diamond Award for the 14th year in a row. And Our State magazine ran a wonderful feature in their July issue on our artist-in-residence, Chip Holton. If you missed it, ask for a copy at the front desk or click here to read it. You’ll be glad to know that we offer reservations, call-ahead seating and even a pre-ordering service at all of our restaurants to expedite service for parties (including parties of one or two). At Lucky’s in Cary, we can handle groups up to 70 people in a semi-private dining area. In Greensboro, the private Starlight dining room seats 10, and we can host larger parties in the dining room. To enjoy the extraordinary food from Green Valley Grill or Print Works Bistro in the beautiful private event spaces of the hotels, please contact the events team at 336-544-9615 (O.Henry) or 336-478-9111 (Proximity). Great news! We can customize a gift certificate for you with a hotel night stay (or even a variety of packages) for your fortunate recipient. Just call the Proximity at 1-800-379-8200 or O.Henry at 1-800-965-8259. All of our businesses offer gift certificates for purchase seven days a week, or you can order online here. 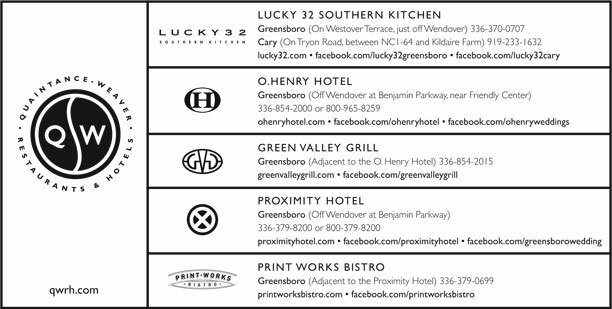 Visit printworksbistro.com, greenvalleygrill.com and lucky32.com for the current seasonal menus, the latest wine list and online reservations. With larger parties we offer pre-ordering to expedite service so you have more time to enjoy your visit.